If you had to pick one flowering plant whose appearance on the scene signals the return of spring and all her little angels, which one would it be? The plant collectors might scream “Adonis!” — the neophytes “Forsythia!” but for me and for many others, there is no sweeter reminder of warm days ahead than the humble daffodil. And, unlike forsythia or Adonis, there is more than one reason to grow them. Daffodils make excellent cut flowers. They are reliable perennials that come back year after year. 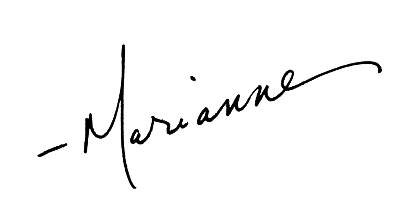 Many have a strong scent and can perfume a bathroom or bedroom with just two or three flowers. You don’t have to have a garden to enjoy daffodils. Anyone can buy a few stems at the grocery store and brighten bedside tables and bathroom countertops with their joyful heads and sweet fragrance. Children can be brought to gardening through the miracle of planting a few bulbs in fall and watching spring unfold; and even the sports writers and day-traders amongst us know what a daffodil is and how it can brighten an office desk covered in Post-It notes and stained coffee cups. Most importantly (for those of us who sleep lightly and have a pile of throwing stones by the front door), daffodils are practically deer and wildlife proof. As they are in the amaryllid family, they contain alkaloids that creatures would rather avoid. So you get all of the above benefits, without the additional cost of anti-depressants. Though the first daffodils of the season are starting to fade with the warmer weather we have had recently, we are actually smack in the middle of prime daffodil season – a time to enjoy and observe this universally loved flower. Clever gardeners trying to decide what to plant next fall will not leave these decisions up to tired October brains and sale racks, but will tour public and private gardens now, take photos of the blooms that capture their hearts, and look around for labels and/or a friendly gardener to tell them what they’re looking at. 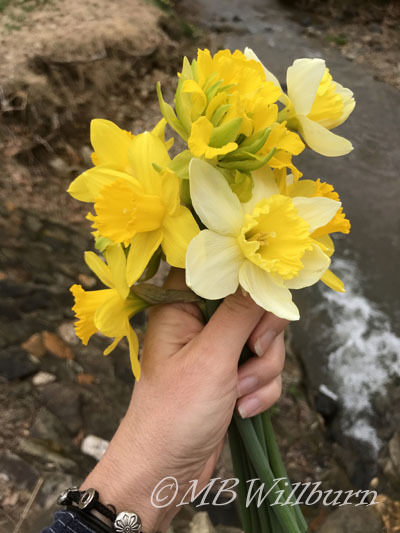 A handful of streambank daffodils. Daffodils are sun lovers and do their very best with at least seven hours of full sun exposure. They can survive in partial shade, but they will not thrive – which explains the times that you have seen a few nestled into woodlands at the site of what must have been an old homestead; or scattered lightly along a shady verge. I myself have several lightly flowering clumps of ‘Van Zion’ daffodils along my own partially shaded creek that have been here since we moved in. I am thankful to a reader on Instagram who was able to identify this heirloom farmhouse favorite for me. 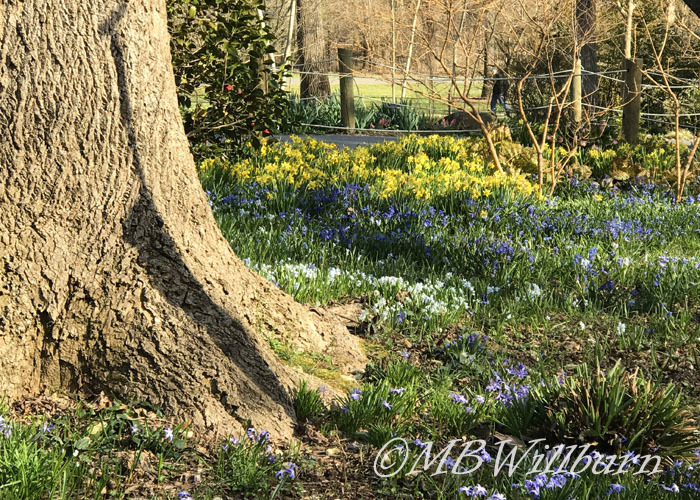 A sandy, loamy soil is the preferred growing media for daffodils, and in this gorgeous mixture they will divide rapidly and come back year after year. If you don’t have that kind of soil, join the Million-Gardener Club, and instead work in a little organic matter such as compost or well-rotted manure when you plant. Daffodil bulbs should be planted points up, three times as deep as the height of the bulb. There are many tools to help you do this beyond the humble trowel – soil knives can be levered to create skinny pockets, hollow bulb planters take out a core of soil with a bit of wrist work. And planting augers attached to hand drills make you throw away the first two options and never go back. Life. Saver. Daffodils like evenly moist, well-drained soil, but will rot in boggy conditions. If you experience a long drought after your daffodils have bloomed it is wise to give them a bit of extra water to help ensure good blooms for next season. If your daffodil clumps have stopped blooming or are only blooming sporadically (and they are in full sun), it is more than likely that they need more food. You can dig them, separate them and thereby give them more access to nutrients, or you can take an easier route and just dress your clumps with well-rotted compost. A sprinkling of wood ash is also of benefit. 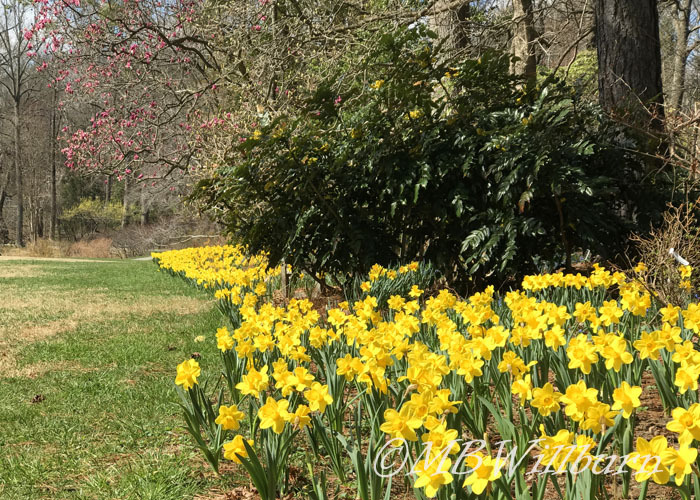 Contrary to the claims out there, daffodils do not necessarily naturalize, which is to say, spread themselves around in lawns and planting beds. 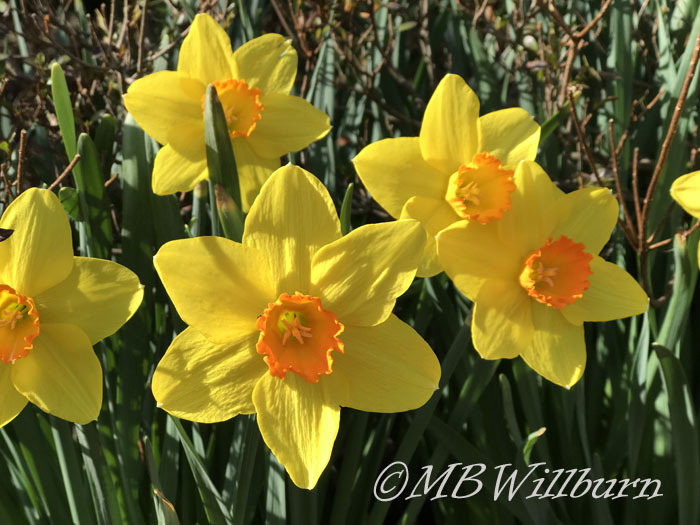 Hybrid daffodils (which comprise the majority of what we plant) tend to stay in one place and multiply – naturalizing is generally undertaken by species daffodils when they find themselves in ideal conditions. Narcissus bulbocodium is one such species (early), as is N. poeticus var. recurvus (late). The best way to cut a daffodil is not to. The hollow stems do not take up water as efficiently as the solid core further down the stem. Reach down to the base of the flower instead and pull up gently – you’ll hear a snap. Pick the flowers with an idea of your vase in mind – choosing many of the same height or those that differ only slightly. For best results, plunge the stems directly into water the second you pick them. Though daffodils come in a range of colors from pale salmon to purest white, the chances are when you think of a daffodil, you think in yellow. And, as yellow is one of the first colors of the spectrum visible to our eyes, it’s important to think carefully about how you are siting them. Is it wise for instance to plant a handful around your septic tank cover – alerting all and sundry to the eyesore on the side of your house? Or to plant them in a perfect but boring circle around an island bed when all around them is brown and grey? The trick is working in volume, and letting the flowers echo color in places all around your garden, so the island bed blooms are not working on their own, but are repeated several times – against the house or near a wall or even in a container by the front door. Use two to three cultivars for succession bloom near each other so your season is extended, and stay away from regimented spacing. And don’t forget the companion plants and bulbs – scilla, chionodoxa, mertensia, hellebores, muscari and late tulips to name only a few. For shock and awe displays, pick an area with good exposure (south facing hillsides are made for daffodils) in association with something weighty in the landscape – a shed, barn, entrance, driveway, etc… All the better if it’s in an area that you are joyfully content to leave alone for several weeks after blooming; because…. Daffodils need at least six weeks after flowering to create and store food for next year’s display. If you’ve given them that much time (or noticed the foliage yellowing) you can cut them back to the ground. Do it any sooner and you’re harming your bulbs. “But what about the ugly, floppy foliage?! ?” you scream. They have allowed something wild and wonderful in the landscape to be wild and wonderful only within specific parameters. This contravenes the very nature of daffodils and the beautiful expression of seasonal shifts in the garden. They’re also not doing their bulbs any favors. Place your daffodils near fast-growing spring bloomers and summer foliage-makers such as dicentra, hellebore, brunnera, ostrich ferns and Japanese anemone. Relax more. The presence of foliage signifies the presence of mind to plant for a spring garden. Good for you. ‘Ceylon’ is a particularly long lasting hybrid. Some of my favorite daffodils? ‘Thalia,’ for its fragrance, multi-stems and pure white tones; N. bulbocodium for its delicacy and naturalizing abilities; ‘Ceylon’ for long bloom time and petite orange-red trumpets; ‘Tahiti’ for color and elegance in a double; and the common but lovely ‘Ice Follies’ for its ability to complement a large massing of golden daffs with heads of white and lemon yellow. There are so many. Start deciding and ordering now for the planting schemes and dreams of next spring. A version of this article was originally published in The Frederick News Post and is reprinted here with kind permission.